The outward form of idolatry is but a veil, concealing the one Truth like the veil of the Saitic Goddess, Only that truth, being for the few, escapes the majority. To the pious profane, the veil recovers a celestial locality thickly peopled with divine beings, dwarfs and giants, good and wicked powers, all of whom are no better than human caricatures. Yet, wile for the great majority the space behind the veil is really impenetrable – if it would but confess the real state of its mind – those, endowed with the “third eye” (the eye of Shiva), discern in the Cimmerian darkness and chaos a light in whose intense radiance all shape born of human conception disappears, leaving the all-informing divine PRESENCE, to be felt – not seen; sensed – never expressed. Toward the close of the Pralaya (the intermediate period between two “creations” or evolutions of our phenomenal universe), the great IT, the One that rests in infinity and ever is, dropped its reflection, which expanded in limitless Space, and felt a desire to make itself cognizable by the creatures evolved from its shadow. The reflection assumed the shape of a Mahârâja (great King). Devising means for mankind to learn of his existence, the Mahârâja built out of the qualities inherent in him a palace, in which he concealed himself, satisfied that people should perceive the outward form of his dwelling. But when they looked up to the place where stood the palace, whose one corner stretched into the right, and the other into the left infinitude – the little men saw nothing; the palace was mistaken by them for empty space, and being so vast remained invisible to their eyes. Then the Mahârâja resorted to another expedient. He determined to manifest himself to the little creatures whom he pitied – not as a whole but only in his parts. He destroyed the palace built by him from his manifesting qualities, brick by brick, and began throwing the bricks down upon the earth one after the other. Each brick was transformed into an idol, the red ones becoming Gods and the grey ones Goddesses; into these the Devatâs and Devatîs – the qualities and the attributes of the Unseen – entered and animated them. 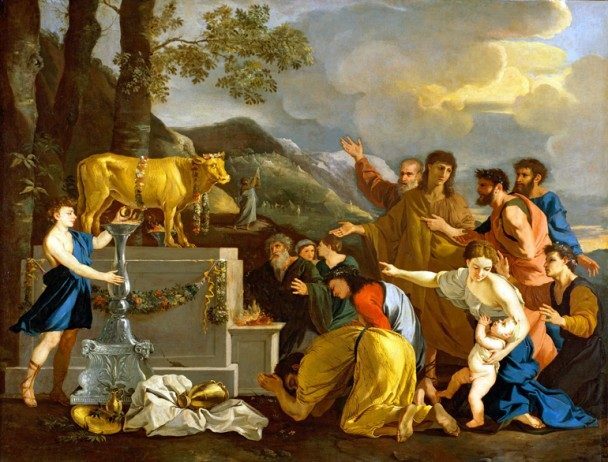 This allegory shows polytheism in its true light and that it rests on the One Unity, as does all the rest. Between the Dii majores and the Dii minores there is in reality no difference. The former are the direct, the latter the broken or refracted, rays of one and the same Luminary. What are Brahmâ, Vishnu and Shiva, but the triple Ray that emanates directly from the Light of the World? The three Gods with their Goddesses are the three dual representations of Purusha the Spirit, and Prakriti – matter; the six are synthesized by Svâyambhuva the self-existent, unmanifested Deity. They are only the symbols personifying the Unseen Presence in every phenomenon of nature. Suras are in the Vedas deities, or beings, connected with the Sun; in their occult meaning they are the seven chief watchers or guardians of our planetary system. They are positively identical with the “Seven Spirits of the Stars.” The Suras are connected in practical Occultism with the Seven Yogic powers. One of these, Laghima(n) or “the faculty of assuming levity,” is illustrated in a Purâna as rising and descending along a sunbeam to the solar orb with its mysteries; e.g., Khatvânga, in Vishnu Purâna (Book IV). “It must be equally easy to the Adept to travel a ray downwards,” remarks Fitzedward Hall (p. 311). And why not, if the action is understood in its right and correct sense? Eight great Gods are often reckoned, as there are eight points of the compass, four cardinal and four intermediate points over which preside also inferior Lokapâlas or the “doubles” of the greater Gods. Yet, in many instances where the number eight is given it is only a kind of exoteric shell. Every globe, however, is divided into seven regions, as 7X7=49 is the mystic number par excellence. To make it clearer: in each of the seven Root Races, and in every one of the seven regions into which the Occult Doctrine divides our globe, there appears from the dawn of Humanity the “Watcher” assigned to it in the eternity of the Æon. He comes first in his own “form,” then each time as an Avatâra. (1) The neophyte – representing the Sun, as “Sahasrakirana” he of the thousand rays” – is shown kneeling before the “Hierophant.” The latter is in the act of cutting off seven locks of the neophyte’s long hair,2 and in the following – (2) – illustration, the postulant’s bright crown of golden beams is thrown off, and replaced by a wreath of sharp ligneous spines, symbolizing the loss.3 This was enacted in India. In trans-Himâlayan regions it was the same. In order to become a “Perfect One,” the Sakridâgâmin (“he who will receive new birth,” lit.) had, among other trials, to descend into Pâtâla, the “nether world,” after which process only he could hope to become an “Anâgâmin” – “one who will be reborn no more.” The full Initiate had the option of either entering this second Path by appearing at will in the world of men under a human form, or he could choose to first rest in the world of Gods (the Devachan of the Initiates), and then only be reborn on this our earth. Thus, the next stage shows the postulant preparing for this journey. (3) Every kind of temptation – we have no right to enumerate these or speak of them – was being placed on his way. If he came out victorious over these, then the further Initiation was proceeded with; if he fell – it was delayed, often entirely lost for him. These rites lasted seven days. We must notice and try to explain some of these great and smaller cycles and their symbols. Let us begin with the cycle of Mahâyuga, personified by Shesha – the great serpent called “the couch of Vishnu.” because that God is Time and Duration personified in the most philosophical and often poetical way. Thence Shesha is the cycle of the great Manvantara, and also the spirit of vitality as of destruction, since Vishnu, as the preserving or conservative force, and Shiva as the destroying potency, are both aspects of Brahma. Shesha is said to have taught the sage Garga – one of the oldest astronomers in India, whom, nevertheless, Bentley places only 548 B.C. – the secret sciences, the mysteries of the heavenly bodies, of astrology, astronomy and various omens. Shesha is so great and mighty, that it is more than likely he will some day, in far off future ages, render the same service to our modern astronomers. Nothing like “Time” and cyclic changes to cure sceptics of their blindness. Moreover they have two methods and two chronologies to show those events verified – the Roman Catholic and the Protestant. The first relies on the calculations of Kepler and Dr. Sepp; the latter on Clinton, who gives the year of the Nativity as A.M. 4138; the former holds to the old calculation of 4320 by lunar, and 4004 by solar years. l In every ancient cosmography the universe and the earth are divided into seven parts or regions. 2 See Judges xvi, again, where Samson, the symbolical personification of the Sun, the Jewish Hercules, speaks of his seven locks which, when cut off, will deprive him of his (physical) strength, i.e., kill the material man, leaving only the spiritual. But the Bible fails to explain, or rather, conceals purposely, the esoteric truth, that the seven locks symbolize the septenary physical or terrestrial man, thus cut off and separated from the spiritual. To this day the High Lamas cut off during public consecrations a lock of the hair of the candidates for the religious life, repeating a formula to the effect that the six others will follow, when the “upâsaka” IS READY. The lock of hair or tonsure of the Roman Catholic priests is a relic of the same mystery-idea. 3 No need of explaining that Sanjnâ – pure spiritual conscience – is the inner perception of the neophyte (or chelâ) and Initiate; the scorching of it by the too ardent beams of the Sun being symbolical of the terrestrial passions. Hence the seven locks are symbolical of the seven cardinal sins, and as to the seven cardinal virtues – to be gained by the Sakridâgâmin (the candidate “for new birth”), they could be attained by him only through severe trial and suffering. 4 An emblem referring to the “ploughing” and sowing the renewed earth (in its new Round) with fresh seeds of life.